Apple introduced a marathon of new products at the Worldwide Developers Conference this week. Though many of us expected new retina display hardware to steal the show, WWDC was all about software for both desktop and mobile. With features like home automation, Dropbox-like file storage system, a redesign of Spotlight and app icons – the list goes on and on. You will now be able to reach your audience more often, and more meaningfully, with the introduction of “actionable notifications,” which allow users to complete small tasks or get app benefits without actually launching the app. A user could, for example, “like” a Facebook photo they’re tagged in, within the notification banner and without switching away from that text message they were in the middle of crafting. With this new feature, users are not only more likely to stay engaged on mobile for longer but will also have greater opportunity to interact with your app without even opening it. In a move to compete with Android, Apple also announced that developers will be able to design their own widgets that people can use to customize the Notification Center. Widgets enable you to deliver timely parts of your apps to users in bite-size pieces. If, say, you are an ecommerce company, your widget could potentially display new arrivals to pique your audience’s interest and encourage them to open your app. In short, customizable widgets are a way to prevent drop-offs, adding value and nudging users to keep coming back to your app. The App Store has finally caught up with Google Play and now allows you to include a video demo, in addition to screenshots, on your app’s page. With more than 1.2 million apps in the App Store, store optimization is crucial – and a compelling video is a useful way to give your app a leg up in the crowded marketplace. For startups with more than one app, Apple’s new bundling feature lets you package multiple services together and offer promotional pricing. Extend the shelf life of your products – or leverage your existing apps to launch new ones – while simultaneously providing convenience and savings for your users. 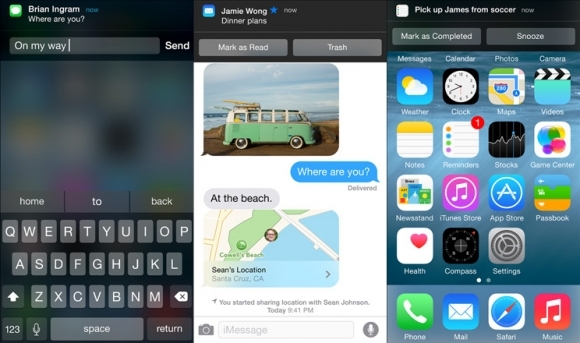 Beta testing service TestFlight, which Apple acquired in February, will be native to iOS 8. At FarShore, we’ve long been using TestFlight as a third-party service but now that Apple is bringing beta testing in-house, distribution and feedback processes will be significantly smoother during the pre-launch testing period. Until now, iOS apps have lived in “sandboxes,” but Apple is working to streamline movement between apps on the same device. You can now enable extensions on your software so that it “talks” to other apps. For example, as demonstrated on the WWDC stage, mobile photography app VSCO Cam could offer their filters within Apple’s stock photo app, creating a seamless photo taking and editing experience and relieving the user of that clunky back-and-forth switch between applications – ultimately leading to greater engagement and lower drop-off rates. iOS 8 will go live to the public in September, but the beta version is available to developers now, so start thinking about getting your apps ready for the new mobile software. Want to learn more? Reach out for access to our iOS app launch strategy doc.